Yesterday morning started well, but clouded over in line with what the weathermen had told us would happen. We had set ourselves up, however, to outsmart the weather. Our rain-proof day out involved travelling down to Pendeen, near St. Just in Cornwall to see an ancient copper mine with a working steam engine, which had sounded really, really interesting ... to Emi and my father. 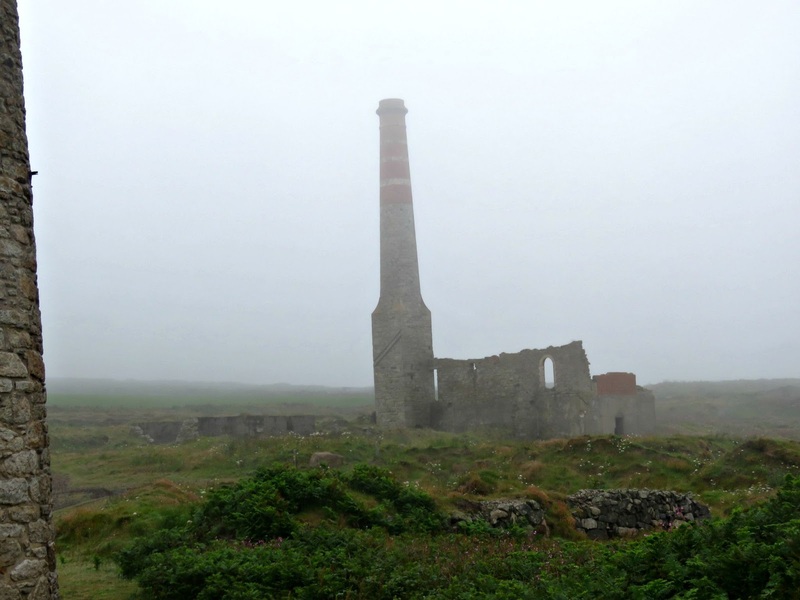 A mine (underground - and in this case one with workings that crept out for over a mile under the sea) a steam engine and lots of mine housings: what could possibly go wrong with our rain-proof plans? Well the first thing that we hadn't factored in was how the unrelenting rain would achieve a horizontal trajectory, blown in on the Atlantic winds, that would seep into and soak our clothes just below the hemlines of our cagoules. We're naturally an optimistic bunch when it comes to the rain. I mean Hello! We're Irish. But as we drove across Bodmin Moor and had to put the headlights on to be sure that the on-coming vehicles could see us through the fog we started to wonder about the wisdom of our plan. There were a few Never mind, it'll brighten up in a bit type comments, but they were voiced with an increasing lack of conviction as the journey progressed and the weather didn't. When we finally made it to the mine we weren't able to see more than a few metres in front of our faces. A sea mist of rain and spray from the waves hung in the air, making it all but impossible to see and appreciate the beautiful coastline. It reminded me of how I used to tell Mr B, as I drove him through the wilds of Galway and Connemara in the sheeting rain, If you could see this it's really, really beautiful. Sweet man, he'd always nod sagely and reassure me that he was quite certain it was all totally exquisite. 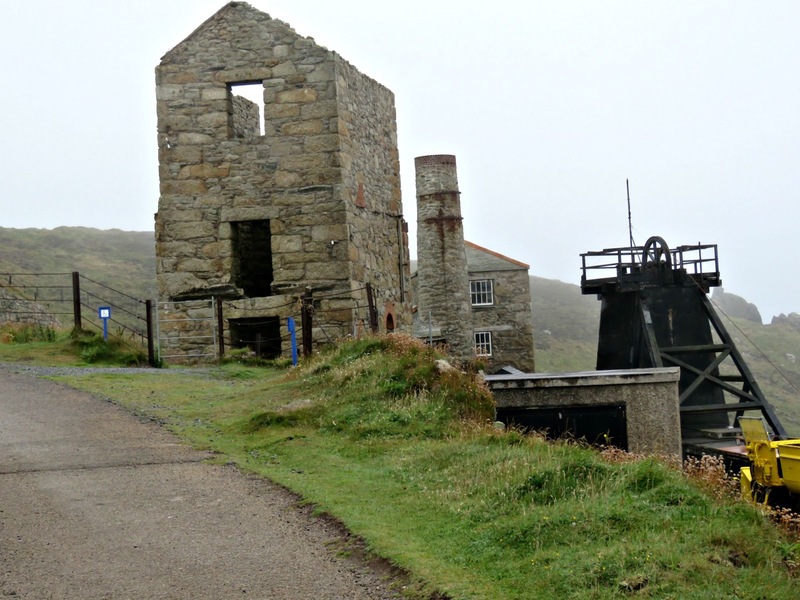 Back in the day the Levant Mine was the place of work for five to six hundred people. The Levant Mining Company was formed back in 1820 for the purpose of extracting tin and copper ore, with arsenic being refined from a by-produce of the tin ore, although archeological evidence suggests that men have been digging ore out of the ground here since around 200 A.D.. 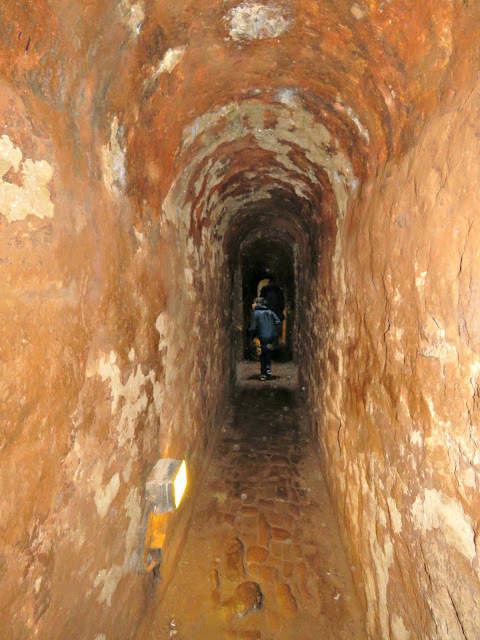 The mine first appeared on a map in 1748. 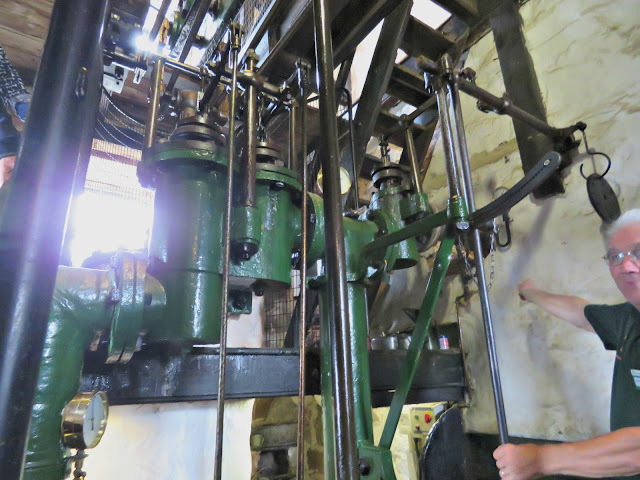 Its main attraction today is its fully operational steam-driven beam engine. Dating from 1840 it's a Leviathan, having a two storey engine house all to itself. We were lucky to catch it in operation. And on a wet day like yesterday it also offered the great benefit of a little heat to help us dry out after all that Atlantic rain. Engines such as this were used to extract the water that would leak into the mine from the sea, to haul the precious ore out of the mine, and to power a man engine, a type of conveyor system used to transport the miners and their tools up and down from the working face far underground to the surface. The deeper levels of this mine are around 600 metres down. I can't imagine what it must have been like for the poor men who had to walk several miles to work on rough paths across the cliff tops, then descend hundreds of metres on badly-lit ladders into the darkness carrying all their kit: shovels, hammers and pick axes, lunch, which was eaten underground and drinking water. They were paid according to the amount of ground that was broken in a shift, so all of this getting there, up and down, was a largely thankless and unrewarded effort. They must have felt grateful when the man engine was installed here in 1857. 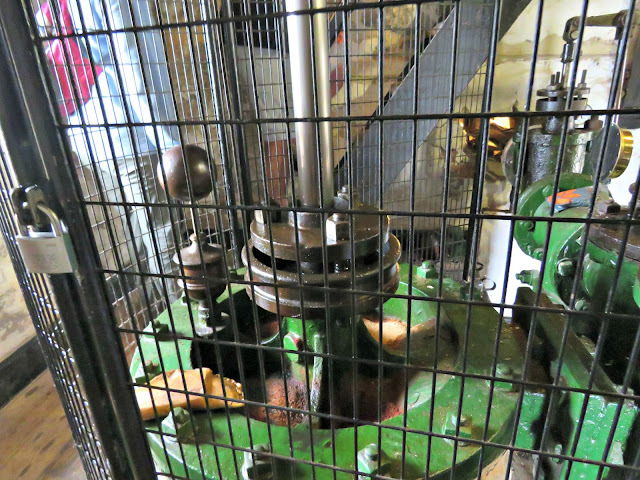 Sadly the history of this man engine ended in disaster in 1919 when the structure collapsed owing to metal fatigue. Thirty one men plunged to their deaths and a number of others were injured. The deeper levels of the mine were never worked again. It was a tough life for all involved. Whole familes: men, women and children from the age of 8 came here to work. The women, known as Bal Maidens, worked mostly on the surface with anvils and chisels in the open air dressing the ore for processing. Having been here on a wet July day when it was something less than a total pleasure to stand outside, I can imagine how tough their lives must have been, out in the elements in all seasons, hammering away at the ore without waterproof clothing, warm overcoats or any protective eye-wear. Children from the age of 8 would have been expected to make a contribution to the family finances, which would have seen them start work at the mine, performing menial tasks such as sweeping and fetching. With a mother and father both working at the mine, life at home must have been pretty grim too. After a long day's toil and the thankless trudge back and forth across the cliff tops to and from the mine I can imagine that few of the adults had much energy or enthusiasm left for attending to the domestic duties that put tasty food on the table and create a warm and comfortable home environment. I'm truly thankful that I wasn't born to live their lives. And next time I feel like having a moan about how it's standing room only on the Central Line I'll spare a thought for the Cornish miners who worked here and put a sock in it. How interesting, Bonny! :) They were living such hard lives for sure. But I guess it was not so unusual even a generation ago. My mom's older cousin (she is in her 70s now) used to tell us how she started working when she was just 5 y-o. She was the oldest, so she had to cook for her brothers and sisters and keep the house clean while her parents were at work. Thank you for sharing all these interesting places and stories, and fantastic photos, Bonny. I am really enjoying them all.